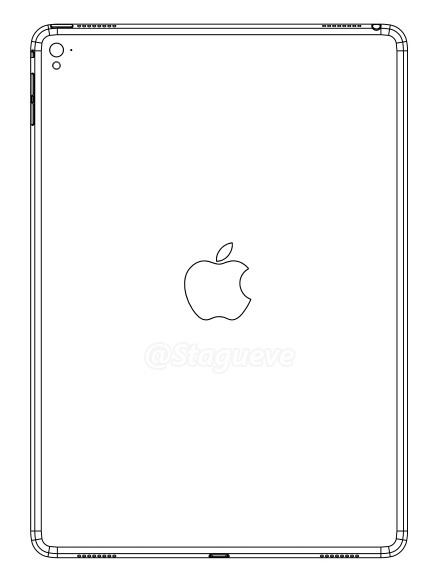 Apple's rumored third-generation iPad Air might adopt not just a quad-speaker design, but also an LED flash for its rear-mounted camera, according to a design illustration shared on Monday. The source of the information isn't fully reliable, but has previously been accurate in two out of three occasions, said French site Nowhereelse. Doubling speaker ports would take the Air in the direction of the iPad Pro, giving it both louder sound and true stereo panning. An LED flash may be less likely, since while many people do use iPads for photography and scanning documents, Apple has consciously left flashes off of every previous iPad model —including the Pro. Apple may want as many upgrades as possible to entice people to buy the Air. iPad sales have been declining for the past several quarters, and lower-cost Minis are now the most popular size format, although the Air 2 is the best-selling individual model. A third-gen Air is expected to ship sometime in the first half of 2016. Little else is known about it, though it will presumably play catch-up with the Pro through a faster processor.